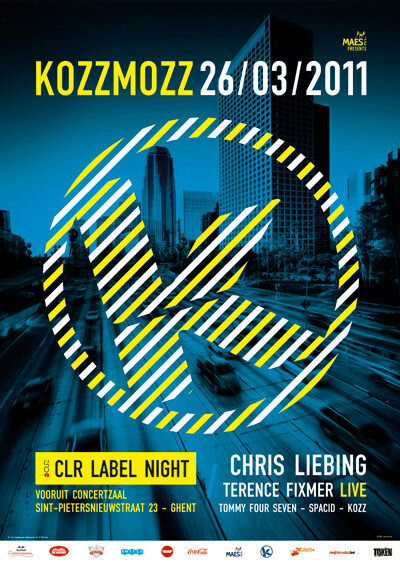 After the truly amazing celebration of our 15th year of techno space travels, we are very proud to announce for our next edition, a collaboration with a label that’s been at the forefront of the techno world for just over 10 years now, namely CLR from the mighty Chris Liebing. He started his career in the famous Omen club in Frankfurt, launched his first label in 1996 and founded CLR in 1999. By the time his first album ‘Evolution’ appeared he had been named “best national dj”, “best remixer” and “best producer” on a regular basis, and he still is regarded as on top of his game. He also collaborated with Speedy which resulted in the legendary Collabs performances and the album ‘Metalism’ on Novamute as well as several Collabs singles. 2009 was marked by the 10th anniversary of CLR and the über popular CLR podcasts, topped off last year with the ’10 Years CLR compilation’ with 10 exclusive tracks from some of the finest techno producers of our time. Next to Chris, you can expect the new live-act from Terence Fixmer who is killing it with his new album on Speedy J’s Electric Deluxe label, ‘Comedy of Menace’. He has performed this live-set already at Berghain, Rex and Mystery land and continues his world-tour in 2011. This Frenchman has a long career in techno with two solo albums on DJ Hell’s Gigolo Records as well as “Fiction, Fiction” on his own Planete Rouge. Add to that copious maxis on prestigious labels, such as Dave Clarke’s White Noise rec., Novamute, Datapunk, Different, Music Man; and remixes for various techno gods, from Sven Väth to Dave Clarke, DJ Hell to Radio Slave and more … He then focused on other sounds and directions, but since 2009 he’s back with a vengeance. This represented a turning point in the evolution of Terence Fixmer’s sound, which deftly avoids repetition by developing soundscapes that appeal to the club crowd, whilst still maintaining musical depth and integrity which is completed in this new album. Later this year a remix by Traversable Wormhole will also appear on CLR which makes him a fresh and perfect addition to this line-up. And no Kozzmozz without an upcoming talent to look out for. This time we welcome Tommy Four Seven, also known as T47, who will be releasing his debut album “Primate” on CLR in March. He’s also known from the Bauhaus project together with Chris Liebing as well as the techno bomb “Surma” on Electric Deluxe. This undoubtedly exquisite techno night will be started and closed off by our residents. Spacid will be warming up the crowd and Kozz, who’s filling in for Kr!z who is playing at Berghain that night, will end the party in his typical style, similar to his legendary set at the 15-years anniversary edition.